Godfather III is generally underrated because because it is more intellectual, subtle, and psychological than the first two. There's lots more Italian language, operatic venues, references to subtleties like the P2 masonic lodge, and there is the inner revelation of Michael Corleone's soul. Pacino should have won an Oscar for his performance. 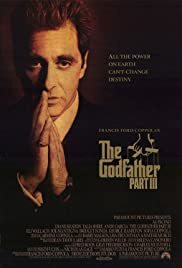 The movie would be a good staging point for a Godfather IV, with "Vincenzo Corleone" and Connie Corleone running things, while developing further the relationship between Michael, and his wife and son.